In the last 25 years or so, wood windows dropped from almost half of all windows sold to less than 20%. Guess which material took wood’s place? Vinyl. That doesn’t necessarily mean that wood windows are lower quality than vinyl or more difficult to deal with. Both wood and vinyl have strong points. Wood windows possess a classic charm that vinyl can only hope to imitate, yet for most homeowners, vinyl’s low cost is a charm that beats wood’s aesthetic allure. Defined Vinyl windows are made largely of high-quality extruded polyvinyl chloride (PVC) Some metal and other types of plastics are used for the sash mechanism. Wood windows are usually wood on the inside (typically pine or Douglas Fir). Exteriors are wood covered with extruded aluminum, PVC, or fiberglass. Colors and Finishes Most vinyl windows come only in white and other light colors. Rich, dark colors that do not fade have traditionally been hard for manufacturers to achieve. One chief value of wood windows is that the inside frames can remain a natural wood color, or be stained if desired. Exteriors and interiors may be any color. Maintenance Vinyl replacement windows never need painting or sealing. The industry has a saying for this: vinyl is final. Wood-exterior windows need painting or sealing throughout their lifetime. Painting wood windows is a task that must be done frequently. Wood windows with aluminum cladding never need painting, but will require care on the interior. Insulating Factor Excellent. Vinyl is a poor conductor of temperatures. With no metal to conduct hot and cold, vinyl tends to keep a constant temperature. Excellent. You’ll find that wood-framed windows are also excellent at inhibiting the transmission of cold or heat from the outside. Cost (Window Only, No Labor) Vinyl windows are about 25% to 50% cheaper than wood windows. Depending of course on the grade of either, but vinyl will always have a lower price tag. Wood windows are simply more expensive. Call it the law of supply and demand, the price of beauty, or just the fact that fewer companies make wood windows–but you will pay more for wood. Appearance Good. Vinyl windows are no longer the pariah of home renovation. With the advances made in frame and color, vinyl windows are considered more attractive than they have been in the past. Excellent. The point of wood windows is usually to keep the interior natural or stained, with sealer on top, thus keeping the wood grain visible. Vinyl cannot easily duplicate this. Turnaround Excellent. Vinyl windows are available from many different manufacturers, so it is not difficult to obtain them on schedule. Fair. Wood has dwindled to a 16%-17% market share, so manufacturers and retailers do not prioritize them. It is usually slower to obtain wood windows over vinyl. Resale Value Good. Within the right context, and if they carry an Energy Star rating, buyers gladly accept that vinyl windows will be part of the home. Excellent. Well-maintained wood windows catch the attention of buyers. Bottom Line Do not be deterred by vinyl windows lack of coolness during your next conversation with your neighbors. They may have bought wood windows because of wood’s cachet, but they also spent more money than you did. Plus, every few years they must haul out the paint can; you don’t. If you’re happy with a simple, well-functioning window, vinyl is for you. You’ve heard the arguments in favor of vinyl but you just can’t bear to inflict plastic fenestration on your 1902 Craftsman home. Yes, you will pay more for your wood windows, but you will also maintain high resale value with your historic home. In summation, there are good reasons to go with either product. It comes down to a question of personal taste, and also budget. 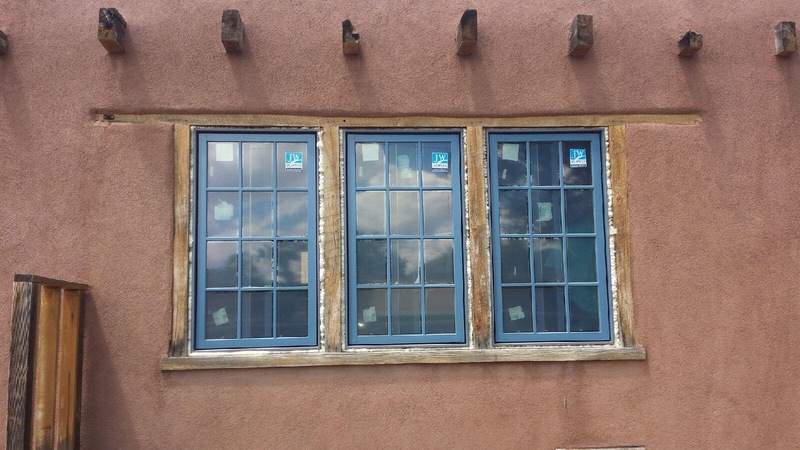 At Glass-Rite we manufacture our own line of energy efficient vinyl windows right here in Albuquerque. Our Energy Quest line comes standard with high efficiency Low-E glass and Argon gas between the two panes. We do also carry 3 different lines of Jeld-Wen’s wood windows. From the simple W-2500 line, to the top of the line Custom and Epic Vue catalogs, we have choices for every home-owner. Come visit us at our shop and showroom to see examples of our products and take a hands-on look at how windows are made. Please also feel free to call or e-mail us with any questions, or to set up an onsite free estimate to get your window project going!